Another question: in which faction would the tropentarn camo be placed? Q 2. Tropentarn would go with the Flecktarn/Upir in my Opinion. Yes it does. there are multiple scenarios where it is important, so stick to the teams approved camos. My team is planning to come to Berget and I read about the camouflage rules. Now most of us have the same team uniform but not all. Aka how big of an issue is it if some of us dont have the correct camo for a certain army division? I don't see any reason why the camo rules wouldn't be strict. You cannot play on UPIR with NAF camo and vice versa. I suggest you and your team make an investment to a camo which will let you play on the same team. There are some common (and affordable) camouflages which are respectively mentioned in either of the factions camo lists so if you are looking forward to attend in more than one Berget I suggest you get a camo that will work in future too. Yes there are armbands and armbands are probably the first way to recognize your enemies. But still there is strict camo lists for either factions so I don't see a reason to make an exception to this. About the surpat I can't really say, I would think if its going to some side it would be on NAF since they have digital camos already but as I mentioned I don't represent BE so it's a pure guess. Crapgame, thanks for your answers. Nice to know that we only have to buy new uniforms and not entire new gear lineups. Regarding the tropentarn; so it is the nationality of the pattern that decide which faction it belongs to and not the actual camo pattern itself? Tropentarn is a very bright/light camo pattern, like for example multicam, and since many of the patterns on the UPIR side are dark I think tropentarn would fit better at the NAF side. It would also be great if tropentarn is accepted on the NAF side since we are playing as Germans so it would be much better for us to purchase new uniforms in that pattern rather than multicam or something else from another country. Could this decision perhaps be revised so that we can use tropentarn when playing as NAF? Then it would be flecktarn (dark) on the UPIR side and tropentarn (light) on the NAF side and people playing as Germans can chose a German camo pattern regardless of the side they are playing on. Arginj wrote: Crapgame, thanks for your answers. Nice to know that we only have to buy new uniforms and not entire new gear lineups. Stick in the camos mentioned in the lists. That is the best way. If you have to buy new camo why don't just buy something that fits the rules and if you are willing to play in german gear why don't you play on UPIR with Flecktarn? TBH I didn't get this camo-discussion last year and don't get it this year either. BE has stated quite strict rules about the camouflage things. Why not to stick with them? You have to use a uniform which is allowed for a certain side, f.ex. you cant use multicam on UPIR, or woodland on NAF. pekezu wrote: Stick in the camos mentioned in the lists. That is the best way. If you have to buy new camo why don't just buy something that fits the rules and if you are willing to play in german gear why don't you play on UPIR with Flecktarn? Because they obviously want to play as NAF, maybe they have some friends from another team playing there? I was in the same situation last year, and asked the same question too, wanting to use 3-farb flecktarn (tropentarn) on NAF. I did argue that it would fit in well with NAF, and look much better and be more visually distinct than just combining our flecktarn vests/headgear with marpat, which is what BE suggested we should do, but it fell for deaf ears and we were denied. 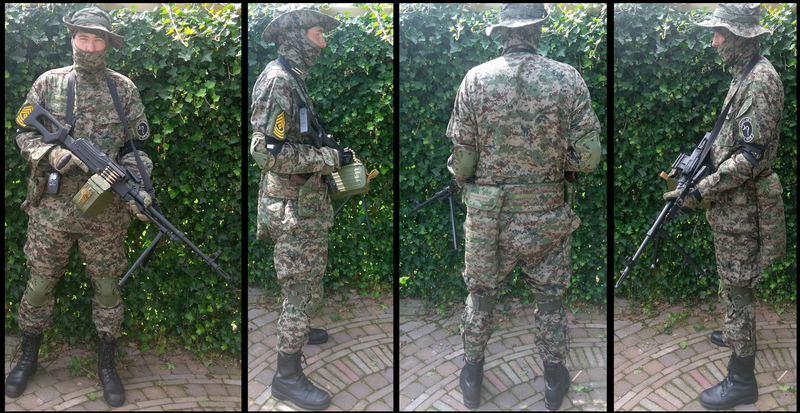 We ended up buying Multicam uniforms and combining them with our flecktarn gear (as a kinda-sorta-KSK-look) to play as NAF. In your situation if I didn't have Multicam I would have probably done the same thing and buy it. There is a huge price range so everyone should have a possibility to buy decent MC or MTP stuff. And it is also more and more common around the world and probably will be listed in every possible airsoft game in the future so that wise it is something that I would consider to buy. Ghille suits, 3d Leaf suits/ Leshy suits, Viperhood, sniper veils. full body, top or bottom all fall under the rule of ghillie suit for game purposes. What you wear under the ghillie/Veil should be appropriate to team camo rules unless special agreement is made with BE staff. Having split/mixed uniforms are ok within your own BE team rules, NO mix between Upir and Naf camo.